Fall is a beautiful and a busy time in the Gatlinburg and Pigeon Forge area. With a plenty of amazing roads and routes to choose from in East Tennessee, we thought we would help you find some breathtaking views of the fall foliage by telling you about a few of our favorite Gatlinburg and Great Smoky Mountain auto tours. After you have settled into your American Patriot Getaways Gatlinburg or Pigeon Forge cabin, chalet or condo try one or more of these amazing auto tours. Gatlinburg, Tennessee & Roaring Fork Motor Trail - In downtown Gatlinburg, turn at stoplight #8 onto Airport Road. At the intersection, continue straight into the Great Smoky Mountains National Park. Continue until you see the sign for Roaring Fork Motor Nature Trail. It's a narrow one-way road that meanders through great forests and parallels Roaring Fork Creek. Because it's narrow and winding, motor homes, buses and trailers are prohibited. There are several pull offs where you can stop and enjoy or photograph the brilliant colors that Gatlinburg has to offer. Nature trails and hikes also originate from the main road, including hikes to Rainbow Falls, Grotto Falls and Mt. Le Conte for those with a bit more adventurous spirit. Several historical pioneer structures have been preserved along the road for exploration, and other points of interest include the Reagan tub mill where corn meal is ground and a waterfall called "Place of a Thousand Drips"--an extraordinary sight when it has been raining. This drive is roughly ten miles and takes the better part of two hours to truly enjoy this tour, depending on traffic. Cherokee, North Carolina and Balsam Mountain - Just north of Cherokee NC, on U.S. 441, turn onto the Blue Ridge Parkway--very near to the Great Smoky Mountains National Park. This scenic parkway follows the crest of the Blue Ridge Mountains for 469 miles--to Shenandoah National Park in Virginia. But that's another trip. About 11 miles along the Parkway turn left onto the road to Balsam Mountain campground. Turn at the campground and a little ways down the road you'll see Heintooga Picnic area. Walk to the far end of the picnic area and enjoy the autumn views from Heintooga Overlook. From the picnic area, take the one-way, unpaved Balsam Mountain Road. At this point, you are 27 miles from Cherokee, North Carolina. Enjoy the color from the northern hardwoods and eventually the southern hardwood color as you work your way back to Cherokee. Take note--Balsam Mountain Road closes November 1 and it is not recommended for larger vehicles such as buses, trailers and large campers. This tour takes about 3 hours and covers approximately 48 miles. Townsend, Tennessee and Cades Cove — From Pigeon Forge, turn at Traffic Light #3, Wears Valley Road, travel approximately 14 miles to Townsend, Tennessee. 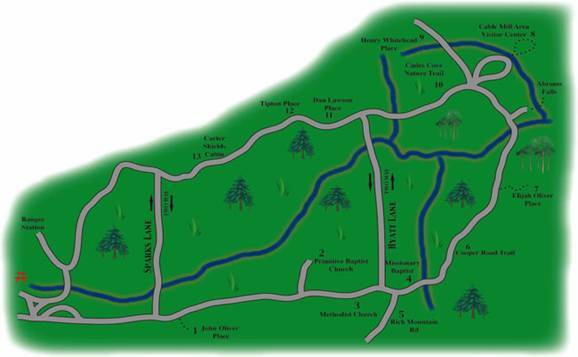 From Gatlinburg, travel 2 miles on South 441 to the Sugarlands Visitors Center, turn Right onto Little River Road. A couple of miles into the ride you will come to the parking area for Laurel Falls, a truly magnificent double falls at the end of a 1 mile paved hike. After this amazing pit stop continue on the scenic drive on Little River Road through the national park to Townsend, Tennessee. From Townsend, Tennessee, enter the Great Smoky Mountains National Park and turn right at the "Y" onto Laurel Creek Road towards Cades Cove. Cades Cove is the most popular attraction in the Park--visited by approximately 2 million enthusiasts each year. Enter the 11-mile loop road and follow it for six miles. If you can break yourself away, turn onto Forge Creek Road, following it to Parson Branch Road. Parson Branch Road is unpaved but maintained in excellent condition for passenger cars. You can enjoy the color and scenery for 8 miles until it ends at Hwy 129. Turn right onto Hwy 129 and wind your way past Chilhowee Lake to the Foothills Parkway. According to Park officials, this drive offers some of the best--and earliest--color in October. The Parkway ends after 17 miles where you can turn right on Hwy 321 and enjoy some of the offerings in Townsend--the "Peaceful Side of the Smokies". This auto tour takes about 4-1/2 hours to cover 65 miles. It's a treat! Please Note: Cades Cove is closed to motor vehicle traffic May-Sept until 10 am every Wednesday and Saturday so that bicyclers and walkers can travel the loop without the danger of cars. Deals Gap, North Carolina and “The Tail of the Dragon” - Crossing Deals Gap at the Tennessee/North Carolina state line, the Dragon is considered by many as one of the world's best motorcycling and sports car roads. Anyone looking for an exciting highway will enjoy this stretch of US129. The road is desolate and can be a real adventure in the winter months. You have to deal with bears, turkeys, deer, and wild boars in the road, trees down, ice/snow, and tractor-trailers taking-up both lanes in the curves. It is not a road for the squeamish, but if you're looking for a little excitement don't miss this one. To some the Dragon begins on the North Carolina side at Fugitive Bridge with a view of the Cheoah Dam where Harrison Ford jumped in the movie The Fugitive. It ends 14 miles across the mountain at the Tabcat Creek Bridge in Tennessee. US129 climbs through The Slide, a steep series of "S" curves where one would not want to meet a tractor-trailer. The road then levels and straightens until a series of curves approaching the Crossroads of Time, one of the main hangouts for cyclists. Next comes Deals Gap and the Tennessee State Line. We'll leave the rest for you to describe after you travel it. Many just remember curve after curve after curve and surviving the run of their lives. 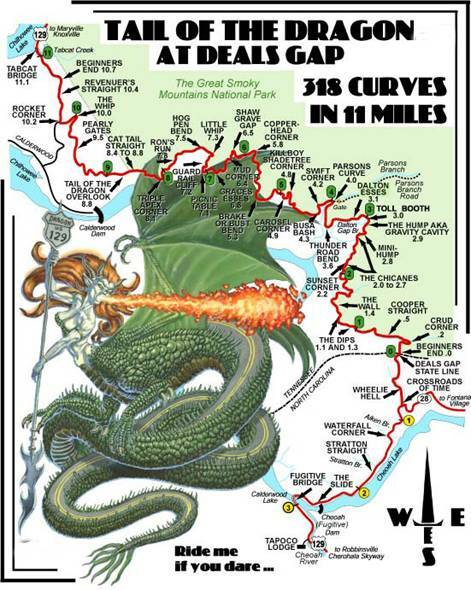 The best way to the Dragon from Gatlinburg is to take 441 south into the Great Smoky Mountain National Park about 2miles. Then take a right onto Little River Road (73) at the Sugarlands Visitors Center. This road (34 miles) is listed as one of the 10 most scenic roads in America. Continue on Little River Road into Townsend. Do not take the Cades Cove Turn Off. In Townsend you will merge onto TN 321 West. Continue on 321 West to the Foothills Parkway. This is another very scenic road. Take the Foothills Parkway to US 129. Turn Left onto US 129 South and you will meet the dragon in about 3 miles. This auto tour takes about 2 hours to cover 49 miles depending on traffic. Or you could make a big loop if you continue south on US 129 through Robbinsville to US 74/19. 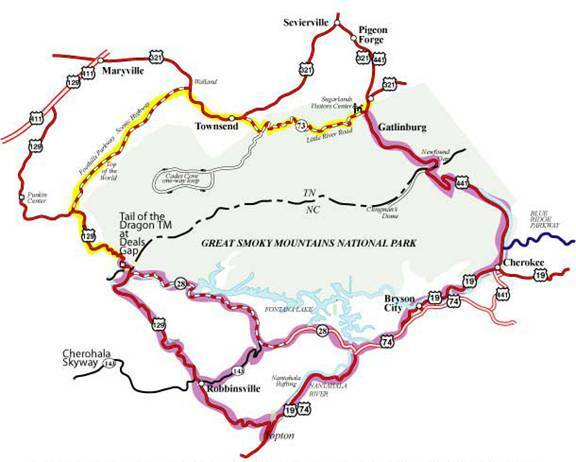 Then take US 74/19 East through the Natahala Gorge and US 441 North through Cherokee, North Carolina and then over the mountains through the Great Smoky Mountain National Park back into Gatlinburg. This auto tour takes a full day to cover 158 miles depending on traffic.